Have you always wanted to learn how to quilt? Our beginner class is a four session class (Ten full hours of instruction!) designed to take you through ALL the steps of making a quilt. 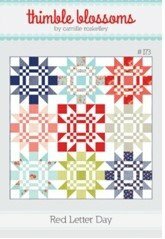 We will be using the RED LETTER DAY quilt pattern by Thimble Blossoms as our guide for easy to follow along directions and illustrations.The pattern is available for purchase at our shop and is required for the class. We will be making a wall hanging or table topper sized quilt that is 27 inches square, this more manageable size quilt for beginners. Our goal is to make quilting stress free and fun so that you leave the class dreaming up your next quilt! Requirements: You must take all 4 sessions to complete the quilt so you would need plan to be available for all 4 sessions. This class must have at least 2 students that can make all 4 sessions for it to be held or a refund or rescheduling for the next available class would be applied. Quilting Tools, Notions and Fabrics will be needed for the class sessions and a list will be provided upon registering. You are welcome to stop in the shop to see what we recommend for the class and to help you get started you will receive 15% off any tools or notions you will need for the four class sessions. If you do not have your own sewing machine to bring to class, you can reserve a one of our Elna machines for use in class on a first come basis.